Almost always first class reporting and great fun to have Rod and Taki to lighten the moment.....with sage comments along with the irony. I’m a fan! You offered a free trial if I added the app. NO FREE TRIAL on the app, so I deleted the app. That's bad customer relations and now I am no longer interested in subscribing. Refreshingly opinionated and outspoken. My new favorite read. Magazine is the best but the download system is rank. Also in App spotlight is pretty useless as only looks in downloaded articles, it should look on the web. Unsurpassed insiders' views of UK politics, from grand strategy through titillating gossip. First class reviews of the UK's manifold cultural offerings. Less intuitive and clumsier than prior versions. Call this one a fail and bring back the predecessor please. 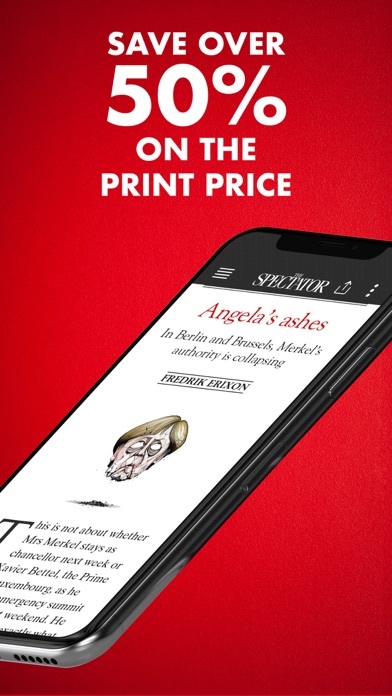 I had read the SPECTATOR for years in print and was thrilled to have the ease of the APP. I love the writing. HOWEVER, subscribing thru iTunes (which is the only way you can do a monthly sub) has become a nightmare in using the app. For many months the app is not recognizing the iTunes sub on any iOS device. Mini iPad, iPad or iPhone. I have submitted several 'ticket' and no one responds with a viable solution. There is no web id for iTunes users and no matter how many times I delete and reinstall the app there are NO DOWNLOADS of the current mags. Nor can one use the iTunes sub to access the website ... This is really unforgivable - the app has not been updated since 2014 and there was a major iOS update this year. It's sad. 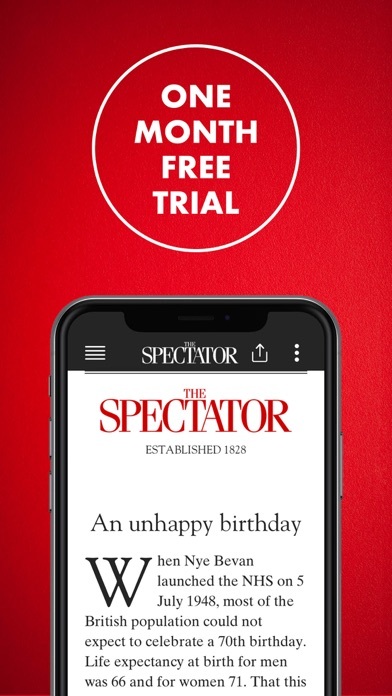 I doubt I will hear from any one at the SPECTATOR. If I do I will come back and write another review. Do not purchase this app. Reading the Spectator is like going to a party and talking with fascinating people who are unpredictable. Most are charming and amusing in an inimitably British way even though their opinions vary widely and may sometimes be strange. I highly recommend it. Simply the best economic, political and philosophical comment I read. Keep it up Fraser and team! Wonderful writing, a great read to end the working week. 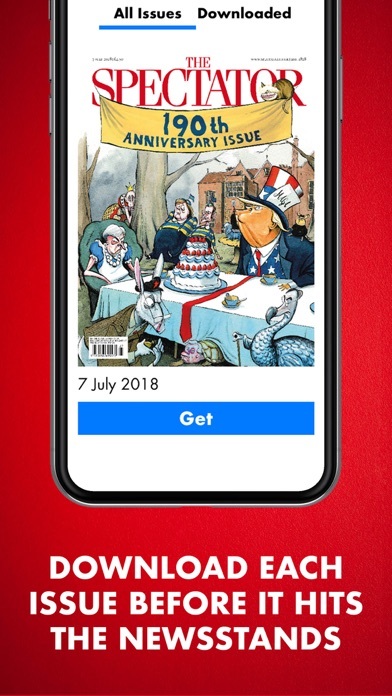 Slightly to the left of the WSJ and much more to the right of the NY Times, the Spectator combines the very best of British commentary on world politics and the arts. The contributions of the weekly columnists are erudite and constantly entertaining. Overall, the best weekly read for anyone with the most marginal interest in UK culture but beyond this a fine-edged view of word events. I've been a Spectator reader for perhaps twenty years and consider the magazine one of the best available. As an American citizen, I tend to skip over much of the writing on British domestic politics, but the Spectator offers so very much more. There's an amazing variety in the subject matter on offer. The reviews are useful. Most of all, the use of language is precise; the articles concise. I'm old fashioned enough to believe that what's worth saying not only may but must be said clearly. The Spectator's writing is the antithesis of the usual prose of wet concrete that infest journals like (to pick one at random) the New York Review of Books. And the Spectator is often quit funny, too. Such a deal. The app has been greatly improved over the years. Early versions of the app made reading a bit of a penance. Those day are mercifully over. Great magazine for the variety of topics, originality of the pieces, and especially smoothness of the prose. But on an iPhone 6, not so much. Like a cry of reason from beyond the darkness that is the modern conservative movement in the US, The Spectator celebrates common sense over zealotry and reasonable discourse over ideology. Let the left be blinded by beliefs and ridiculous schemes. I want a magazine that deals with the world as it is, not as it "should" be, and that magazine is The Spectator. 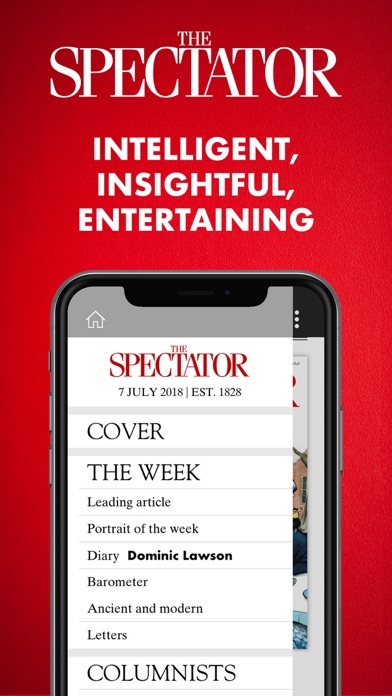 I've been reading the Spectator for years. It's basically a magazine for political junkies but as an ex-pat I find it keeps me in touch with the zeitgeist in England. They are now full on fascists. Delingpole and Moore are the first ones I'd put against the wall. Then that asswipe Taki. It’s a disgusting magazine and I’ve cancelled my subscription.